Pay parking. Details: $7, with $1 off if you visit the aquarium. LPI charger Out of Service, missing cord and paddle, probably unrepairable. From I-405N: Exit CA-22 West toward Long Beach. CA-22 becomes 7th Street. Turn left on Alamitos Dr. Alamitos becomes Shoreline Dr. Turn left on Aquarium Way. From I-405S: Exit I-710 South and follow direction below. From I-710S: Exit (left) on Shoreline Dr toward Downtown / Convention Center. Exit ramp becomes Shoreline Dr. Turn right on Aquarium Way. 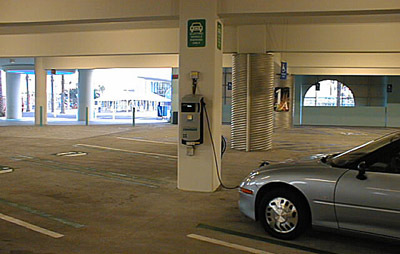 After entering parking garage, chargers will be on your right. Driver reports requested when the charger is fixed. Generated on Sunday, 1/30/2011, at 10:49:46 PM PT from evcnall.fp7.